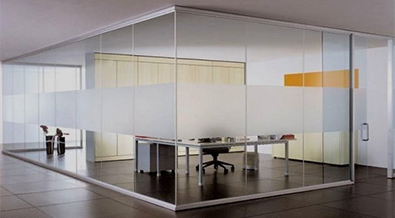 By utilizing glass it is an ideal way partition a space while maintaining a balance between aesthetics and function in your small office, home office or agencies. We offer the wide range of innovative products for every needs. From Sandblasted and acid etched glass for total or partial privacy while keeping the the working environment bright. Wide range of colored glass, custom printing of your design or company images or logos directly on glass and great selection of hardware to add elegance to your office space. Contact us today to discuss your design and ideas and we will be happy to consult and provide you with the best and affordable solution.